Circus show full of rhythm, emotions, and laughs. 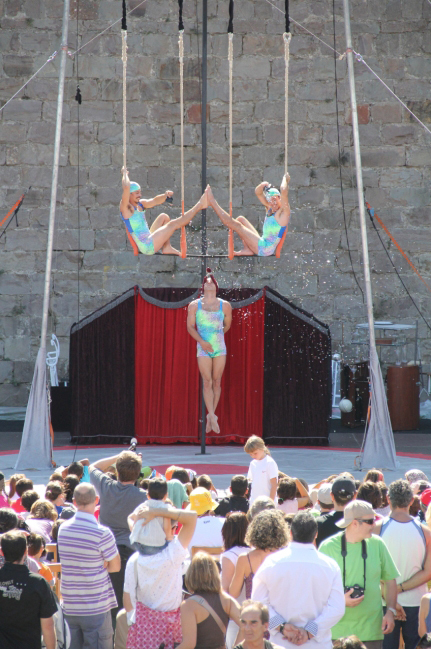 Trapeze, balance, unicycle, juggling… Their objective is to make the public laugh and have a good time. Lighting: they adapt to street and stage conditions. They have their own technician if it is on a stage. 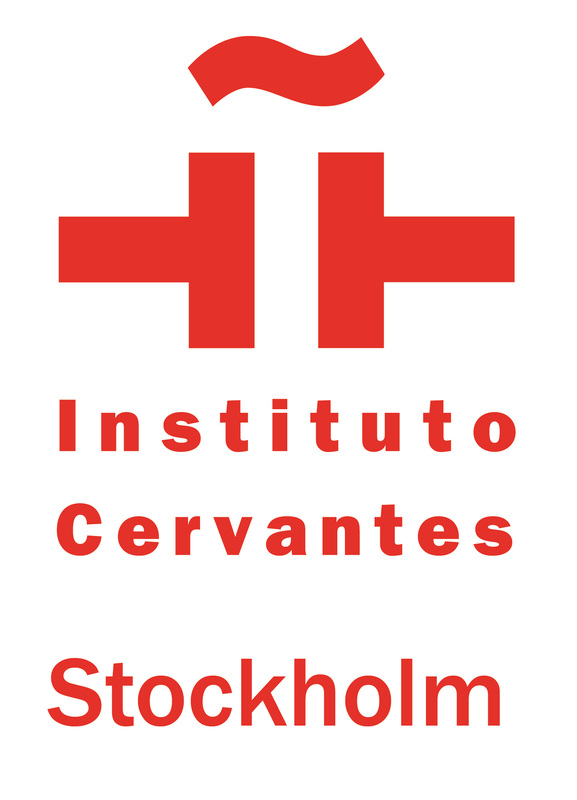 There is the possibility to give a workshop on circus techniques. They can be for beginners or advanced. Maximum number of attendees: 10/15. Circus show with disputes and hide-and-seek. 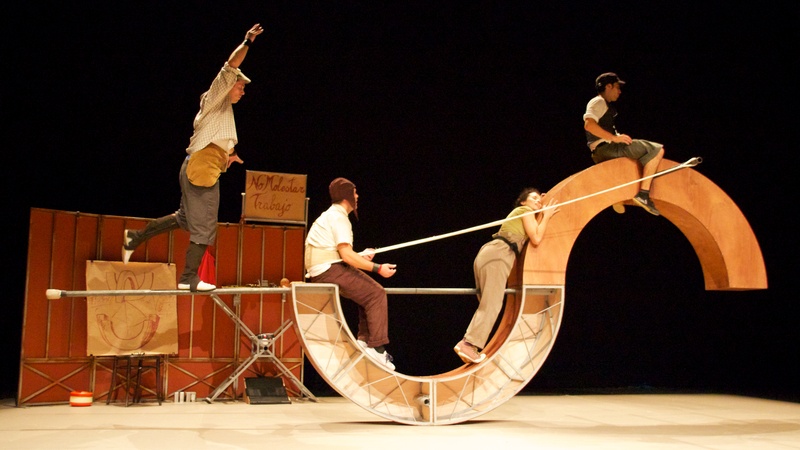 Acrobatics, mortal jumps, human pyramids… the show offers several layers of interpretations of itself that reflect on how we read society as a whole. To transport the set-up design and attrezzo: 1 box 240cm. x 140cm. x 120cm. – weight: 500kg.- 2 flight-cases: 120cm. x 60cm. x 80cm. – weight: 100kg each and a special case of 14,5kg. Possibility to give a workshop on acrobatic research for couples and groups. It is meant for circus, dance, theatre and other performing arts students. Maximum number of participants: 20. Four characters lead us to a 20th century factory. They will make the public feel all sort of emotions by feeling identified with them. The characters are brought to their risk, absurdity and tenderness limits. Set design: the set design is usually transported by boat. All the elements can be made on the site except for a wheel that has to be transported. Lighting: the lights used will be according to the hall. The company has a minimum of 48 channels and adapts to the hall. If it is made in the streets during the day, no lights are needed, and by night, at least 2 towers with 4 lights each. Sound: the company can bring its own equipment. 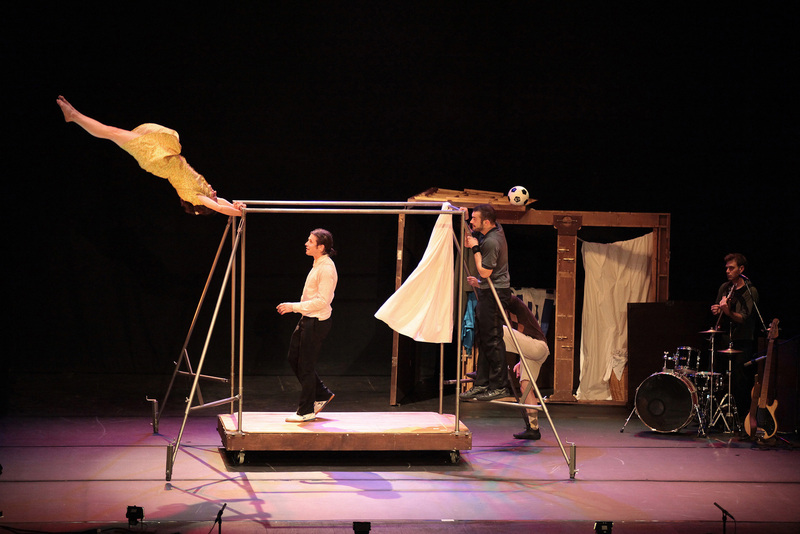 Possibility to give a workshop on acrobatics and movement for all levels. Maximum for 8 couples. 3 hours/day sessions.